6 Week AM Fitness Camp July 2018 Get a head start on your fitness goals! Get a head start on your fitness goals! Join us for 6 weeks of early morning personal training, guaranteed to wake you up and get you ready to take on the world. In the 6 Week AM Fitness Camp you and a small group of companions will get in great shape, lose weight, and get stronger. Your certified coach and partners will be there every step of the way to help you reach personal goals for bodyweight, strength and improving movement ability. Each week you’ll be able to measure your progress and see your strength and fitness grow. Class activities include functional and bodyweight movements, mobility work, kettlebells, and cardiovascular exercise. There are many benefits to getting a good workout done early, one being the satisfaction of knowing you have taken care of your health first, and you can get on with the rest of your day. Especially now that its fall, you can use that extra time to enjoy the afternoon sunshine, or just take care of yourself or family. Enjoy getting it done, sleep better at night, and burn more calories all day long! Try out any of our classes! In addition to 3 days per week of challenge sessions, you will also have access to the full array of fitness classes offered at KMSF including TRX, conditioning, KO bag, and more! You can enjoy the variety or take advantage of the extra classes to make up a session and stay on track. Brandi Day has been in motion all her life, being involved in team sports for many years. Beginning as a young teen, Brandi played rugby and soccer. Later she coached soccer, and even spent time as a professional football player. She also studied a variety of martial arts. Starting with Karate in college, then trying Muy Thai, Jiu-Jitsu, Kenpo and boxing. Then she got hooked on Krav Maga in 2009. Since 2009 she has advanced to Blue Belt level, and is certified in TRX Suspension, Functional and Group training. 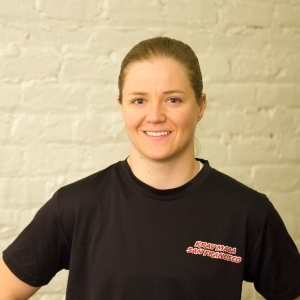 Also Brandi enjoys the pragmatic, informal and fluid Krav Maga approach that gives practitioners simple answers to complex problems. Krav Maga confirmed her approach to fitness, which is that variety and cross training is good! Fitness should apply to real life and help people withstand the rigors of self defense, be capable of surviving tough situations and generally feel strong, happy and confident. Whether its zooming around the Bay Area on her motorcycle, throwing leather in a sparring session, or coaching a fitness class, Brandi feels that every day is a chance to learn and grow, and to share that enthusiasm with other people.